I wanted to thank Coach Winkler and each Fieldcrest High School basketball player for the thrill they gave my two boys Friday night. We should be proud of their terrific record, but should be more proud of how they play the game. After the victory, Coach Winkler and each player took the time to visit with the young children, signing autographs and smiling for pictures. The next day the second grade knights returned to El Paso for recreational basketball. As the kids were warming up, several were acting as if they were the high school boys, saying "I will be Ropp, I will be Baxter, ect." Many times it is hard to predict who are children are going to see as role models. Unfortunately, too many times those role models are just sports related and no one takes to time to see what is really important. However, with the events that unfolded on Friday night, the Knights proved you can be a role model even after the buzzer goes off. Congrats on all your accomplishments and good luck as the season continues. Thank you for penning your latest editorial "A Tribute to Jack Pierce". I also reread your previous articles on Mr. Pierce and you very accurately conveyed the essence of the man. I had the privilege, in the early '50s, of playing sports under Mr Pierce's tutelage and also being a classroom student in his World History class. Paul Arahood still talks about being out-run by the Coach who was running backwards while we were running forward. Paul was fast in his own right. Mr. Pierce's comments on pain and discomfort experienced during football practice was "It's all in your head", 90+ degrees was not hot, just "think cool". In the early 60's, I had the privilege of working with Mr Pierce during my short tenure as a Junior High School teacher in Minonk. He was most helpful and understanding to the neophyte that I was. We would meet once or twice a day in the coal-room next to the boiler-room for our necessary nicotine fix. We solved many of the world's problems during these sessions. We would sometimes have some "friendly" political discussions with Mr Yates, with whom we did not always agree, but always respectfully. Mr Pierce was indeed one of those men, of that time and place, that commanded respect by their mere presence and certainly earned it by their actions. A special thank you from my mother, Gertie Kelm and myself, to all those who remembered my mother on her 100th birthday on Dec 18, 2009. She really enjoyed the cards and letters she received, calling me every day to update me as to whom she had heard from. At her age, she has outlived most of her friends. The cards made her feel as if she has not been forgotten. She is in relatively good health, still has her natural red hair, and has a better memory than some people much younger than her. Again, thanks to all who helped make her day special!!! There will be a meeting this Sun., Feb. 21 from 4-5pm in the Fieldcrest East cafeteria. Parents of all 8th graders are encouraged to attend. We will be organizing pre-graduation activities for the 8th graders. These activities are for ALL 8th graders and are parent sponsored. Many volunteers will be needed. The purpose of the meeting Sun. will be to select which activities will be provided and form committees to handle each activity. There will be a parent letter sent home via your 8th grader as well as an announcement on the Fieldcrest website. WOW! Was I surprised. January 29 was my birthday and I spent it climbing North Mountain in Phoenix and having dinner with one of my daughters and her sons. Two weeks before I heard a substantial storm was headed to Arizona. Rather than being snowbound in my home on Haigler Creek near Young, Az., I headed to milder Phoenix. A week and half later the news reported that the roads were open to where I need to go. As I got to the top of the Mogollon Rim, the highway was just two narrow lanes with snow piled on both sides to 4-5 feet above the top of my truck. After a short time I turned from the highway onto a dirt road and headed off the Rim to Young, Az. When the postmaster saw me she said, "I'm sure glad you're back" and handed me a carrier of mail. I remember thinking that it was almost as much as I get after spending three months in Minonk. When I started opening the mail the first letter was a birthday card, then another birthday card, then another birthday card, then another……. 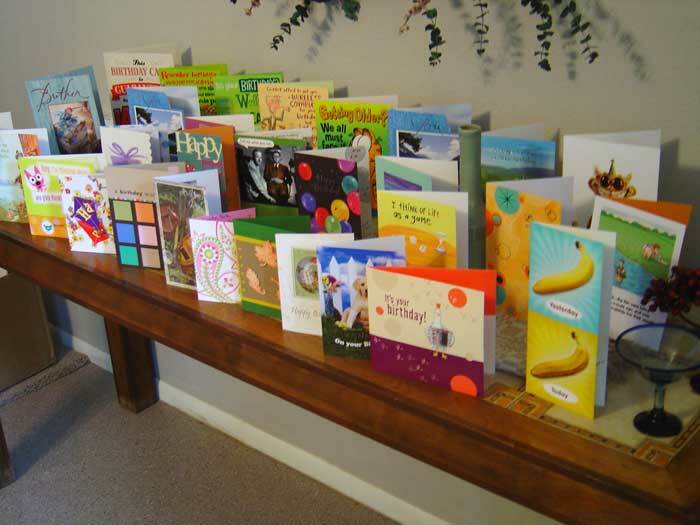 By the time I opened over 40 cards including email cards I was humbled. To think so many people were so thoughtful at the same time to one person---and I was that person---made me pause. Martha (Eikenmeyer) Owens reminded me of the surprise birthday parties my mother planned for me when I was young. Martha said, "It was my introduction to bingo AND to getting a present at someone else's party!" Sometime ago I had mentioned to Bonnie Wagner that I didn't get as many birthday cards as in the days of yore. That seemed to have hatched a plan. Bonnie did say that Dave Uphoff had a significant part in the surprise. Cards came from nine states. And, I could tell that a couple others had a hand in spreading the word. All I can say is THANK YOU to all of you! I appreciate your thoughtfulness. I was deeply touched. Best Wishes! Dave your are right about dull winter nites, last time we went to basketball game I sat with Elmo Davis, been long time. Great bunch of kids, very well behaved, friendly, polite, plus they play hard. Like I said haven't been in Gym for years, don't under stand why the yellow floor,or the kids go and coming during the entire game, that should be stopped. I would like to comment on the wonderful job that the "Blue Wave" does at the basketball games. I know there has been conflicts about seating arrangments but the students in "Blue Wave" show a lot of school spirit. I would like to compliment them on a good job this season. I would like to extend my congratulations to the Fieldcrest boy's basketball team on what has been a most fantastic season. What these young men have accomplished reflects great credit on themselves as well as the entire Fieldcrest community. The perseverance, team work and dedication to a goal and to each other will serve these young men well in the future. Good luck in the state tourneys remaining. Have a little cabin fever? The Minonk Co-Op Preschool is sponsoring a vendor/craft fair from 10-2 on Saturday, March 6th. This event is being held at Immanuel Lutheran Church. The preschool is sponsoring this event as a fundraiser with the hope of making it an annual event. The Spring Fling Extravaganza will feature over 20 area vendor/crafters showcasing their wares. There will be raffles, a bake sale, Girl Scout Cookie sales; many vendors will have cash and carry items available for purchase. There will be a special candle sale with AtHome America where half of the proceeds of each candle sold will be donated back to the preschool. There will be a BBQ lunch available, in limited supply till sold out. Please come out and support this event, we would love to see you there! The Fieldcrest Post Prom committee is holding a "pick 3" fundraiser to raise money towards the after prom event on Friday, April 30th. Our aim is to keep Prom night a safe, drug and alcohol free, chaperoned event for the students. The party is held after the dance in the Fieldcrest High School Gym. Fun, food, games and prizes are provided to all students! If you are interested in purchasing a "Pick 3" ticket, you can email me at m.kalkwarf@mchsi.com or call 309-432-2890. The tickets are $10.00 each and the winner will receive $1,000. If you numbers match the evening pick 3 lottery numbers on Wed. March 17th, you are a winner! We only sell 200 tickets, which covers all combination of numbers, so a winner is assured. If you would like to donate soda, bottled water or cash to purchase food or prizes, it would be greatly appreciated! Congratulations to the Heart Of Illinois Conference Champions on their fine, undefeated season! The Christian Life Fellowship Web Page has been updated. Thanks for looking. I just found out Rita Riedel (the connection w/ Val's Orphanage) is going to be in our community from Tue - Mon to personally thank everyone and answer questions anyone may have about Val's, the earthquake, Haiti etc. If anyone is interested in meeting with her or has a group they would like her to speak with please let me know! She was just outside Val's Orphanage, when the earthquake happened. The MidState Stars Soccer Club wants to thank the Millennium Park Board for believing in rural area soccer by allowing the soccer field to be installed and a providing the nets and field accessories. The goals were put in place last September, and the nets and accessories are being ordered for the regulation size field that meets IHSA requirements for size. The Club wants to recognize Jim Brown and Bob Hakes for their help and support in making this opportunity happen. The MSSC plans to hold their home games at Millennium Park with some games this spring. The MidState Stars Soccer Club will start their 5th year in June with high school level teams playing during 3 of the 4 seasons each year. These players we have competed against the top teams and players in Central Illinois; in the spring the best college players in the Bloomington-Normal area. The fall season, since it is our off season, would be a great opportunity for Fieldcrest and El Paso-Gridley School Districts to form a coop high school soccer program. It would take a rally effort of parent support to convince both school boards to see the need. We tell our children that creating opportunities will create more options in their lives. Isn't it time for a high school soccer program; especially since they would have the best field to play on in Central Illinois!! Thank you Millennium Park Board for believing in the dream! !